Back to School Teacher Interview - Home. Made. Interest. This Back to School Teacher Interview will make it easy to buy your kid’s teachers the perfect gift! Can you believe it is almost time for the kids to head back to school?! Are you secretly breathing a sigh of relief? It’s ok, you can be honest, we won’t tell. Melinda has mixed feelings this year since her son will be starting kindergarten. I can’t believe he is already 5 :(. I know he’s going to love it but they sure do grow up fast.Melinda has such a good relationship with the teachers at his preschool, we send them a lot of goodies that we make on the blog! She knew them so well by the end that it was easy for her to find gifts for them that they would actually enjoy during the holidays and at the end of the school year. Now that she is starting over she wanted a way to figure out what they really want. Teachers can only get so many generic gifts, or cookies, right? What if you knew a little more about them though? Their favorite color, candy, sports team….wouldn’t that make gift giving so much easier? I’m not a teacher but I can only imagine that it would make the gift receiving a little nicer too :). 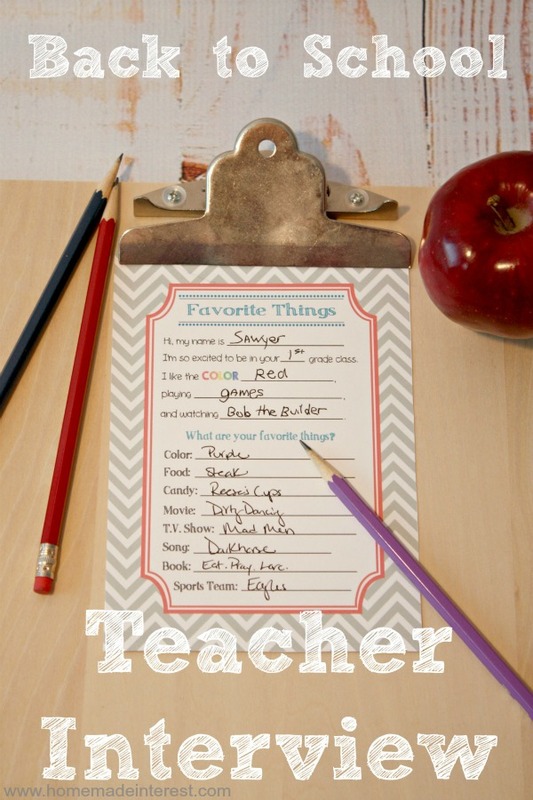 Melinda came up with this simple 8 question teacher interview that will give her a better idea of what her son’s teachers like, and we’ve made it into a 5″x7″ printable to share with you. Now she can send it with her son on his first day of school and her holiday gift giving will be that much easier! Click on the download button above and you will get a .pdf file with 2 – 5″x 7″ images on 1 page. Follow Home.Made.Interest.’s board Back to School & Teacher Appreciation on Pinterest. For other great Back to School ideas make sure to follow us on Pinterest! Such a cute idea! I think this would work for a sports coach, too. Honestly Barb, I need this for all my family members, especially the teens. They are so hard to buy for! This is GENIUS! Thanks for linking up with with Caffeinated Crafters!! This is a fantastical idea!!! I’m always tempted to buy the teacher a gift card. But then I panic that I don’t know what store/restaurant they prefer. I wish there was a gift card for a place that sells gift cards. This is a fabulous idea! What a great way to make each teacher feel extra special. 🙂 I’m sure your children’s teachers love you. Thanks for linking up in the Bloggers Brags Pinterest Party! Pinning to our group board. I LOVE THIS… Thanks for the free printable. Kim, I’m not a teacher just a parent who hates giving gifts that teachers won’t find useful. This helps me get to know my son’s teacher and makes gift giving a little bit easier. Great idea! I’m totally guilty of the generic teacher gifts. This is a great way to personalize them in the future! This is very cute! I love the duo interview idea. Pinned!